Bronxville, April, 2016 — What do the Hudson River, an eel, a coyote and a boy named Marquis all have in common? They are all characters in the production of How to Hug a Tree, one of four performances at Sarah Lawrence College’s Center for the Urban River in Yonkers during April. The other three sessions, all free, will present Jerry Craft, a children’s book illustrator; musicians Kim and Reggie Harris and music and dance presented by Sarah Lawrence faculty members Kathy Westwater and John Yannelli. The performances are part of the college’s “Hudson River Through the Arts” series financed by a grant from National Endowment for the Arts in an effort to bring the arts to underserved populations. Allen Lang, co-director of the Theatre Outreach program which is performing How to Hug a Tree, encouraged people from the community to attend these free performances. “We are very excited about presenting this production featuring original songs written by the ensemble to the community and opening up this wonderful world to children who otherwise might not have access to theatre,’’ said Lang. Saturday, April 2 at 2 p.m. – Jerry Craft – The Artist and Storyteller – Jerry Craft, a recognized cartoonist and children’s book illustrator, will help participants create their own Hudson River characters and cartoon drawings in a step-by-step process and will create on-the-spot drawings suggested by the audience. Saturday, April 9, 2 p.m. – Art of Music – Kim and Reggie Harris, Music of the Hudson River – A concert of songs, stories and narratives about Hudson River, slavery and the quest for freedom. Kim and Reggie Harris will lead participants in song and stories to showing how all races can come together to build a strong community. Saturday, April 23, 2 p.m. – How to Hug a Tree will be presented by the college’s Theatre Outreach program. The musical is directed by award-winning playwright, director and painter Shirley Kaplan, founder of the college’s Theatre Outreach program. It aims to teach children about the importance of the environment and values like loyalty, bravery and ethics. It is part of the Theater Outreach program’s mission to use art to stimulate, encourage expression and build self-esteem across all age groups. Saturday, April 30, 2 p.m. – Music and Dance Along the Hudson River – is an original improvisational piece created by SLC faculty Kathy Westwater (Dance) and John Yannelli (Music) and performed by SLC students. An interactive workshop with children and families will be held before the performance. All performances are free and open to the public. 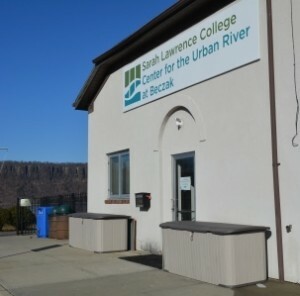 The Center for the Urban River is located at 35 Alexander St. in Yonkers. For more information, call 914-395-2412. Visit www.sarah lawrence.edu or e-mail [email protected] to learn more. This entry was posted in Press Releases and tagged Arts, family. Bookmark the permalink.